I got my new Patchfolio patterns yesterday – just in time for Market! Yay! I’m so happy with how they turned out – that’s what I get when I hire a professional photographer – great pictures! I’m so embarrassed by my previous covers that I’m not even going to remind anyone with a picture. Huge thanks to my photographer Jennifer. You can find her beautiful work here and her blog here. Same pattern, but with 2 additional options for the outside. 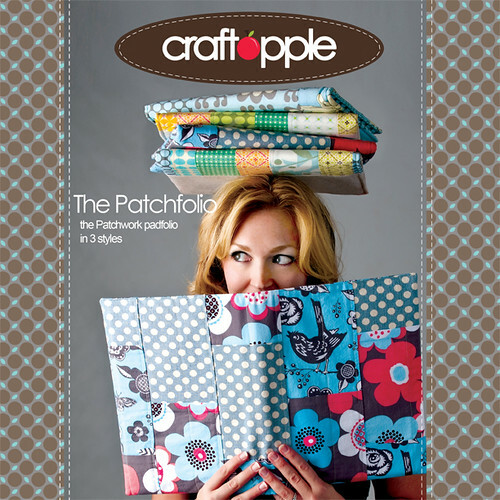 If you’ve previously purchased the Patchfolio from me, you can get the updates here. I love this shot – the angle, the desk, the hair, the shoes. Maybe even 3 second videos of yourself dancing the emotions of the moment (no example here, folks). So I joined Twitter several months ago. Everybody’s doing it, you know. Twitter isn’t a great marketing tool for me for a couple of reasons. First off, I’m a wordy girl and and 140 characters just isn’t enough for me. Plus, I feel weird constantly linking to my site. Don’t get me wrong, it doesn’t bother me when others do it – it just isn’t working for me that way. 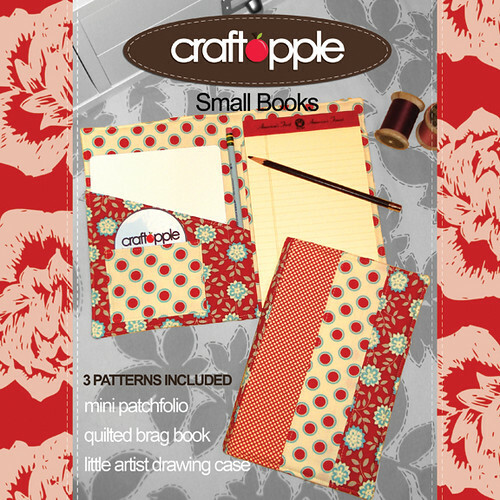 I started a Facebook business page for CraftApple. It feels good – one place for business stuff only. Nobody has to fan it if they don’t want to, and those who do become fans aren’t surprised by sales news when they thought they’d get a dose of creativity. Other advertising venues I’ve tried? Craftster. This was a great first place to advertise and I advertised here for about 6 months in 2008. Sales definitely went up and I stopped after sales seemed to level off. This took place when individual retail pattern sales were my primary source of revenue. Sewing Mamas. I did this for several months at the end of 2008. It was super affordable. Sales jumped that first month, then leveled off. At this point I had 1 distributor, but individual retail continued to be a strong source of revenue. StitchChatter. 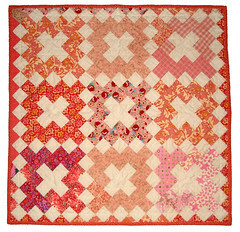 I published with StitchChatter in the Spring of 2009. This was a great experience for me. While there are no graphs to see click throughs, the one big advantage to advertising in a print magazine was I go the attention of a 2nd distributor. This was huge because in the business of pattern writing, distributors are your ticket to making any money. I’m happy to say that distributor sales surpassed individual sales last year. I am a big fan of both my distributors – they have been so helpful to me. I’m sure there are many other places to advertise – Feel free to list them in the comments. I’m also curious as to what has worked for you! Great questions, ladies! It’s a lot easier for me to answer questions than to write a big long post, not knowing what anyone really wants to know. I’ve been designing patterns for a little over 2 years (which still makes me a newbie!) and have learned a ton on my own, but there is also a great book out there if you are interested: Publish your Patterns by Nancy Restuccia and McKenna Linn. I’ll do my best to share my experiences, but keep in mind, there may be things I haven’t encountered as I haven’t been doing this for very long. Now to the questions (interspersed with random pictures throughout to break it up a little)! Did you register as an official company with your state from the get go? No, I didn’t. Honestly, when I published my first pattern, I didn’t know if I could even sell one copy. When I realized this was something I wanted to continue doing (after a couple of months in), I filed paperwork with the state which allows me to purchase resellable items tax free and also enables me to purchase items at wholesale. I also got a DBA so that I could cash checks that were made out to the company name. Each state has their own requirements so you’ll want to check with your appropriate state office. 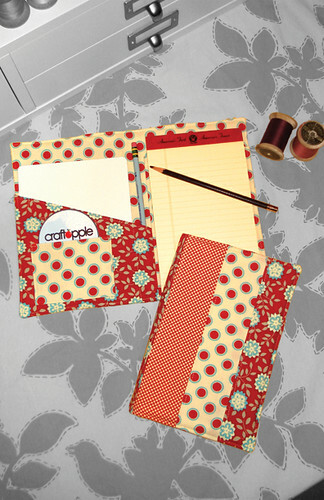 Do you produce your patterns on your own or are they outsourced? So far I’ve done everything myself. I draw my own diagrams and take my own cover shots. When I’m pretty sure that the pattern is finished, I send copies out to test sewers who sew through the instructions and make recommendations. This is by far the most valuable step for me. I hope my test sewers know how much I appreciate them! One thing I had help with recently is hiring a graphic designer to design the cover for me. More on this next. I produce my patterns mostly in MS Publisher. From what I’ve been able to gather, some people love Publisher and others hate it. It has worked well for me so I haven’t needed to look for more complex software. 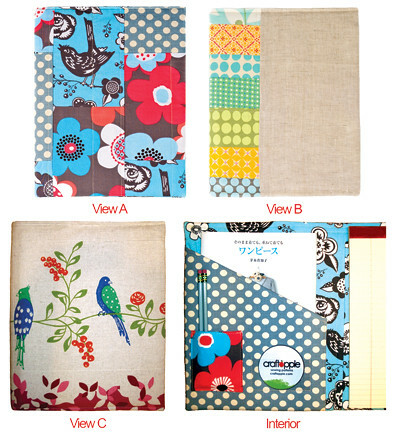 How did you do the background floral image on your pattern covers (at right)? In a word: Photoshop. I hired a graphic designer to design the cover for me and she sent me the Photoshop file that I could drop pictures and text into. This is one of the best decisions I’ve made, since designing the covers has always been a weak area for me. A good graphic designer is important, and lucky for me I found a great one! By the way, I am loving Photoshop right now – it’s taken me a few years to get used to it, but now I’m loving it for many reasons. How are your patterns marketed to quilt shops/online shops? I know there are a lot of pattern designers that can walk into a shop introduce themselves and start talking about their patterns. I am NOT that person. My first wholesale order came from someone who had seen my patterns on Etsy. My second wholesale order came from my local quilt shop where my friend Yvonne started asking me really loudly about my patterns. I had no idea she was going to do that (Thanks Yvonne! 😉 ) but it opened the door to a meeting with the owner about my patterns which led to multiple orders. In many cases I have no idea how quilt shops found me. 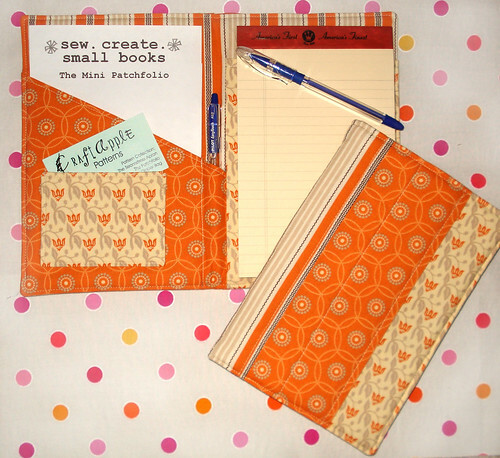 Last year I sent my patterns to a distributor for review and they picked up several of my patterns. 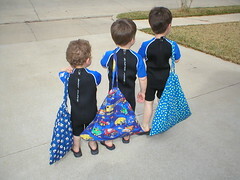 Distributors buy large quantities (below wholesale cost) and sell them to quilt shops at wholesale cost. It’s a nice arrangement because quilt shop owners browse distributor’s sites so it gives my patterns greater exposure. 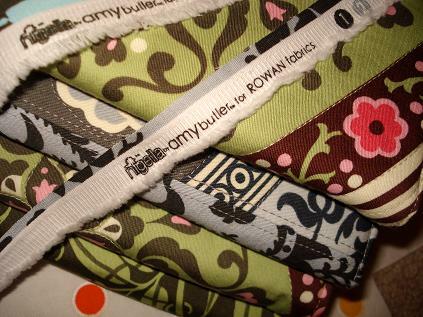 My samples have also been in the distributor’s booth at Quilt Market. Do you have a booth at Market? I haven’t had a booth at Market. Right now, it would really be too much for me to handle both financially and timewise. There is the cost of the booth, of decorating said booth and of getting all the items to Market and back. Plus having to set up and tear down would mean about a week of my time away from my family. Just going to Houston for a day and walking around looking at the booths wears me out – I can’t imagine being gone for a week! I would love to know about the process of actually sitting down and writing the pattern from scratch. It all starts with an idea and a lot of time refining the shape and dimensions of that idea. I take copious notes, then from that break them down into manageable steps. The actual writing takes me a while. Then I have to determine which steps need diagrams. Writing out the instructions and refining the diagrams take about equal time for me. Then off to the test sewers, re-editing, finishing off the cover design and off to the printer! Do you take the pattern to a printer? Yes. I started printing locally, then more recently with with an professional printer who prints on nice paper, folds, and staples the patterns for me for a fraction of the cost. The catch? I have to order a minimum of 1000. How long until you were making a profit? Given the modest start-up costs, after selling for a few weeks, I had made up the above cost. But, there are always more costs along the way. For example, my first pattern pieces I was able to fit on 11″ x 17″ sheets of paper. As I made more profit, and published more patterns, I eventually made large format copies which require a larger up-front cost to print. Would you do it all over again? Go big and make all the investments, or just stick to small sewing for friends and family and the occasional sew for hire? I would TOTALLY do it again. Honestly, I don’t enjoy sewing for hire. I love sewing for my friends, but don’t enjoy sewing with deadlines or for pay. I really enjoy that I have something I can do at home that keeps my brain from turning to mush and keeps me sewing – which really is therapy for me. Right now my big question is about copyright. I understand the importance of protecting your patterns and I’m wondering how you go about getting them copyrighted. Here’s a nifty link for registering your copyright in the USA. Do you worry about whether your chosen name is already on a pattern somewhere and how you could find that out! You know, this hasn’t been a huge concern for me. When I come up with a new pattern name, I’ll google the name and see what comes up. Obviously “The Diaper Bag” is probably out there someplace, but I’m pretty sure “Patchfolio” is unique to me. There is a chapter in the book mentioned above about trademarks, copyright, etc. Good stuff. What kind of publicity do you do? I’ve tried a few things. 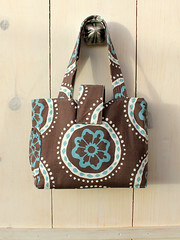 I’ve taken banner ads out on Craftster and some sewing forums. Recently I went in with a group on a print ad in a magazine. My goal in advertising is to get my name out there. This print ad eventually led to me picking up a second distributor. I know this because they mentioned the ad to me, but in general I have no way of knowing if an advertisement is what brought a buyer to my site. Have you ever considered PDF downloads? No, but this is a good question. It has always been my goal to sell my patterns to quilt shops so I never considered going the PDF route. Do you enjoy this? About 90% of the time, I enjoy having a pattern business. There are days, of course when I feel overwhelmed by all that needs to be done around the house and with the kid’s school, soccer, piano, etc. I don’t want there to be any ideas out there that I’m some sort of super mom. There are many days that I can’t find the time to sew or craft. Many of my business desires have to be put on hold when being a mom requires all of my time. It’s just the way it is and I’m sure every mom understands what I’m talking about. There is also always the feeling that “I’m not as good as (fill in the blank)” that I just have to shake off. It was Spring break here this past week and I was able to get some big things on my list done. 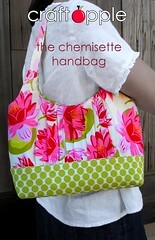 #1: finalize my latest pattern, and send it to the printer. #2: reformat two of my older patterns and send them to the printer. Whew! I have learned a TON about printing in the last week! I am so glad that’s done! So what do I do when I’m done with a pattern? I send in my machine for it’s belated annual tune up (see ‘ya later, Bernie!) and r-e-l-a-x away from the machine. I decided to pick up my knitting needles after a long time away. It took me several minutes just to remember how to cast on – that’s how long it’s been. This time around, instead of having my instructions printed at Kinko’s (where they know me by name) and spending hours folding and stapling, I’ve sent my files off to a professional printer who folds and staples for me. Needless to say, I’m very excited! Professionally printed patterns require some professional designing. And I know my limitations! So I hired a graphic designer, the super talented and gracious Natalie Jost. I made some new Mini Patchfolios for the cover shot. Putting together a pattern for me means lots and lots of sewing. Reading and re-reading instructions, editing, then putting it aside for a few weeks to get a fresh look at it all over again and then more sewing. Throw in some test sewers to help out and the process seems to take forever. And even longer if the printer has a hard time getting the pattern pieces just right. But the Mini Patchfolio? I love making these things. And I love this fabric! It’s Joel Dewberry, of course, and now I’ve used it up. Boo hoo! But there will always be new lines coming out, right Joel? And Amy Butler’s Nigella. Beautiful, isn’t it? I made 4 mini patches with this fabric. Ahhh – even the selvage is pretty. 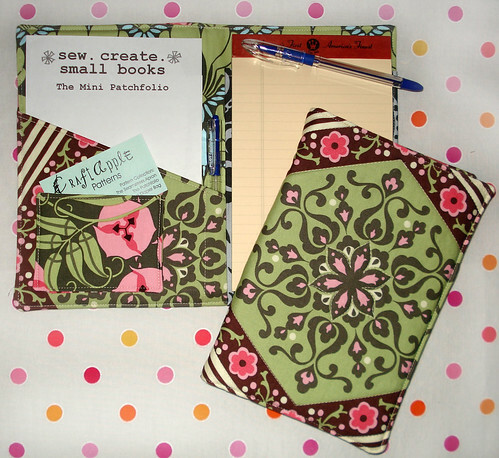 The Small Books pattern is available here.